Voran mobile systems allow you to transport the whole juice production line where needed and place it wherever it is impossible to set up a stationary line. You can even set it up straight in the apple garden. The mobile line allows the whole production to be set up quickly, as the necessary connections between the devices are already done. The same way it is possible to quickly pack up the entire line and transport it to another location. 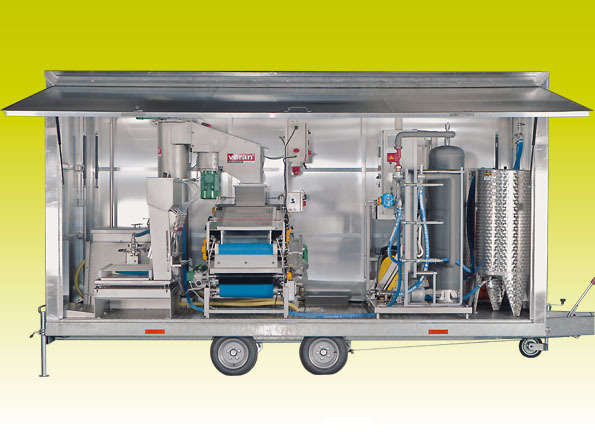 The mobile line is mounted on a car trailer and consists of high-quality Voran's equipment that is used stationery, which can be assembled according to your needs. When choosing equipment it is important to take into account the productivity of the equipment and its compatibility with other devices, so that there will be no 'bottlenecks' in the production system.